Though many planktonic species are microscopic in size, plankton includes organisms over a wide range of sizes, including large organisms such as jellyfish. Technically the term does not include organisms on the surface of the water, which are called pleuston—or those that swim actively in the water, which are called nekton. The name plankton is derived from the Greek adjective πλαγκτός (planktos), meaning errant, and by extension, wanderer or drifter, and was coined by Victor Hensen in 1887. While some forms are capable of independent movement and can swim hundreds of meters vertically in a single day (a behavior called diel vertical migration), their horizontal position is primarily determined by the surrounding water movement, and plankton typically flow with ocean currents. This is in contrast to nekton organisms, such as fish, squid and marine mammals, which can swim against the ambient flow and control their position in the environment. Within the plankton, holoplankton spend their entire life cycle as plankton (e.g. most algae, copepods, salps, and some jellyfish). By contrast, meroplankton are only planktic for part of their lives (usually the larval stage), and then graduate to either a nektic (swimming) or benthic (sea floor) existence. Examples of meroplankton include the larvae of sea urchins, starfish, crustaceans, marine worms, and most fish. The amount and distribution of plankton depends on available nutrients, the state of water and a large amount of other plankton. The study of plankton is termed planktology and a planktonic individual is referred to as a plankter. The adjective planktonic is widely used in both the scientific and popular literature, and is a generally accepted term. However, from the standpoint of prescriptive grammar, the less-commonly used planktic is more strictly the correct adjective. When deriving English words from their Greek or Latin roots, the gender-specific ending (in this case, "-on" which indicates the word is neuter) is normally dropped, using only the root of the word in the derivation. Bacterioplankton, bacteria and archaea, which play an important role in remineralising organic material down the water column (note that prokaryotic phytoplankton are also bacterioplankton). Mycoplankton, fungi and fungus-like organisms, which, like bacterioplankton, are also significant in remineralisation and nutrient cycling. This scheme divides the plankton community into broad producer, consumer and recycler groups. However, determining the trophic level of many plankton is not always straightforward. For example, although most dinoflagellates are either photosynthetic producers or heterotrophic consumers, many species perform both roles. In this mixed trophic strategy — known as mixotrophy — organisms act as both producers and consumers, either at the same time or switching between modes of nutrition in response to ambient conditions. For instance, relying on photosynthesis for growth when nutrients and light are abundant, but switching to predation when growing conditions are poor. Recognition of the importance of mixotrophy as an ecological strategy is increasing, as well as the wider role this may play in marine biogeochemistry. Despite significant macronutrient concentrations, some ocean regions are unproductive (so-called HNLC regions). The micronutrient iron is deficient in these regions, and adding it can lead to the formation of phytoplankton blooms. Iron primarily reaches the ocean through the deposition of dust on the sea surface. Paradoxically, oceanic areas adjacent to unproductive, arid land thus typically have abundant phytoplankton (e.g., the eastern Atlantic Ocean, where trade winds bring dust from the Sahara Desert in north Africa). Aside from representing the bottom few levels of a food chain that supports commercially important fisheries, plankton ecosystems play a role in the biogeochemical cycles of many important chemical elements, including the ocean's carbon cycle. Primarily by grazing on phytoplankton, zooplankton provide carbon to the planktic foodweb, either respiring it to provide metabolic energy, or upon death as biomass or detritus. Organic material tends to be denser than seawater, so it sinks into open ocean ecosystems away from the coastlines, transporting carbon along with it. This process, called the biological pump, is one reason that oceans constitute the largest carbon sink on Earth. However, it has been shown to be influenced by increments of temperature. 2) generated through human activities by increasing plankton production through seeding, primarily with the micronutrient iron. However, this technique may not be practical at a large scale. Ocean oxygen depletion and resultant methane production (caused by the excess production remineralising at depth) is one potential drawback. 2 balance since the early Precambrian Eon. The effects of anthropogenic warming on the global population of phytoplankton is an area of active research. Changes in the vertical stratification of the water column, the rate of temperature-dependent biological reactions, and the atmospheric supply of nutrients are expected to have important impacts on future phytoplankton productivity. Additionally, changes in the mortality of phytoplankton due to rates of zooplankton grazing may be significant. ^ Lalli, C.; Parsons, T. (1993). Biological Oceanography: An Introduction. Butterworth-Heinemann. ISBN 0 7506 3384 0. ^ "plankter". American Heritage Dictionary. Houghton Mifflin Harcourt Publishing Company. Retrieved 9 November 2018. ^ John Dolan (November 2012). 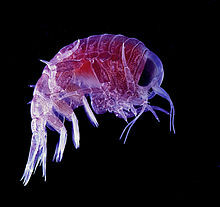 "Microzooplankton: the microscopic (micro) animals (zoo) of the plankton" (PDF). ^ Thurman, H.V. (1997). Introductory Oceanography. New Jersey, USA: Prentice Hall College. ISBN 978-0-13-262072-7. ^ Hensen, V. 1887. Uber die Bestimmung des Planktons oder des im Meere treibenden Materials an Pflanzen und Thieren. V. Bericht der Commission zur Wissenschaftlichen Untersuchung der Deutschen Meere, Jahrgang 12-16, p. 1-108, . ^ Karleskint, George; Turner, Richard; Small, James (2013). "Chapter 17: The Open Sea". Introduction to Marine Biology (4th ed.). Brooks/Cole. ISBN 978-1-133-36446-7. ^ Agrawai, Anju; Gopnal, Krishna (2013). Biomonitoring of Water and Waste Water. Springer India 2013. p. 34. ISBN 978-8-132-20864-8. Retrieved April 2, 2018. ^ "plankter - marine biology". Encyclopædia Britannica. ^ Emiliani, C. (1991). "Planktic/Planktonic, Nektic/Nektonic, Benthic/Benthonic". Journal of Paleontology. 65 (2): 329. JSTOR 1305769. ^ Wang, G., Wang, X., Liu, X., & Li, Q. (2012). "Diversity and biogeochemical function of planktonic fungi in the ocean". In: C. Raghukumar (ed. ), Biology of Marine Fungi. Springer Berlin Heidelberg, p. 71-88, . ^ Hartmann, M.; Grob, C.; Tarran, G.A. ; Martin, A.P. ; Burkill, P.H. ; Scanlan, D.J. ; Zubkov, M.V. (2012). "Mixotrophic basis of Atlantic oligotrophic ecosystems". Proc. Natl. Acad. Sci. USA. 109 (15): 5756–5760. Bibcode:2012PNAS..109.5756H. doi:10.1073/pnas.1118179109. PMC 3326507. PMID 22451938. Retrieved 28 April 2017. ^ Ward, B.A. ; Follows, M.J. (2016). "Marine mixotrophy increases trophic transfer efficiency, mean organism size, and vertical carbon flux". Proc. Natl. Acad. Sci. USA. 113 (11): 2958–2963. Bibcode:2016PNAS..113.2958W. doi:10.1073/pnas.1517118113. PMC 4801304. PMID 26831076. Retrieved 28 April 2017. ^ Omori, M.; Ikeda, T. (1992). Methods in Marine Zooplankton Ecology. Malabar, USA: Krieger Publishing Company. ISBN 978-0-89464-653-9. ^ Dusenbery, David B. (2009). Living at micro scale: the unexpected physics of being small. Cambridge: Harvard University Press. ISBN 978-0-674-03116-6. ^ Martin, J.H. ; Fitzwater, S.E. (1988). "Iron-deficiency limits phytoplankton growth in the Northeast Pacific Subarctic". Nature. 331 (6154): 341–343. Bibcode:1988Natur.331..341M. doi:10.1038/331341a0. ^ Boyd, P.W. ; et al. (2000). "A mesoscale phytoplankton bloom in the polar Southern Ocean stimulated by fertilization". Nature. 407 (6805 http://tass.ru/en/non-political/745635): 695–702. doi:10.1038/35037500. PMID 11048709. ^ Sarmento, H.; Montoya, JM. ; Vázquez-Domínguez, E.; Vaqué, D.; Gasol, JM. (2010). "Warming effects on marine microbial food web processes: how far can we go when it comes to predictions?". Philosophical Transactions of the Royal Society B: Biological Sciences. 365 (1549): 2137���2149. doi:10.1098/rstb.2010.0045. PMC 2880134. PMID 20513721. ^ Vázquez-Domínguez, E.; Vaqué, D.; Gasol, JM. (2007). "Ocean warming enhances respiration and carbon demand of coastal microbial plankton". Global Change Biology. 13 (7): 1327–1334. Bibcode:2007GCBio..13.1327V. doi:10.1111/j.1365-2486.2007.01377.x. hdl:10261/15731. ^ Vázquez-Domínguez, E.; Vaqué, D.; Gasol, JM. (2012). "Temperature effects on the heterotrophic bacteria, heterotrophic nanoflagellates, and microbial top predators of NW Mediterranean". Aquatic Microbial Ecology. 67 (2): 107–121. doi:10.3354/ame01583. ^ Mazuecos, E.; Arístegui, J.; Vázquez-Domínguez, E.; Ortega-Retuerta, E.; Gasol, JM. ; Reche, I. (2012). "Temperature control of microbial respiration and growth efficiency in the mesopelagic zone of the South Atlantic and Indian Oceans". Deep Sea Research Part I: Oceanographic Research Papers. 95 (2): 131–138. doi:10.3354/ame01583. ^ Chisholm, S.W. ; et al. (2001). "Dis-crediting ocean fertilization". Science. 294 (5541): 309–310. doi:10.1126/science.1065349. PMID 11598285. ^ Aumont, O.; Bopp, L. (2006). "Globalizing results from ocean in situ iron fertilization studies". Global Biogeochemical Cycles. 20 (2): GB2017. Bibcode:2006GBioC..20.2017A. doi:10.1029/2005GB002591. ^ Tappan, Helen (April 1968). "Primary production, isotopes, extinctions and the atmosphere". Palaeogeography, Palaeoclimatology, Palaeoecology. 4 (3): 187–210. Bibcode:1968PPP.....4..187T. doi:10.1016/0031-0182(68)90047-3. Retrieved 2016-04-04. ^ Steinacher, M., et al. (2010). "Projected 21st century decrease in marine productivity: a multi-model analysis". Biogeosciences, 7, 979-1005. Wikimedia Commons has media related to Plankton. Wikisource has the text of the 1911 Encyclopædia Britannica article Plankton.